They have it rough, don’t they? Deimos an Abyssinian who came to live with us on February 18, 2006. 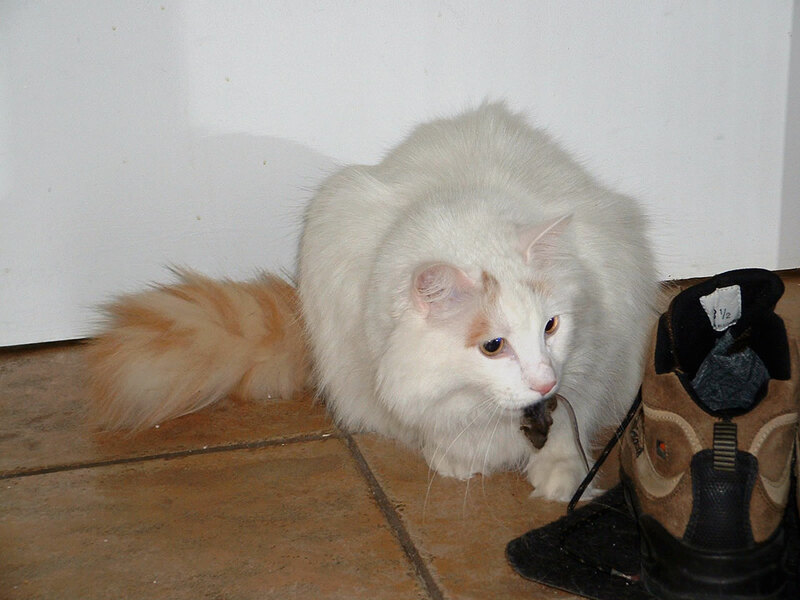 He came from Abykatzen, which is the same cattery where we got Phobos and Lucifur. He just loves his food, so he’s little portly compared to other Abys, and his coat is unusually thick, but he’s healthy. I thought that cats were supposed to use their whiskers to judge whether they'd get stuck somewhere, but Deimos must not believe his whiskers! 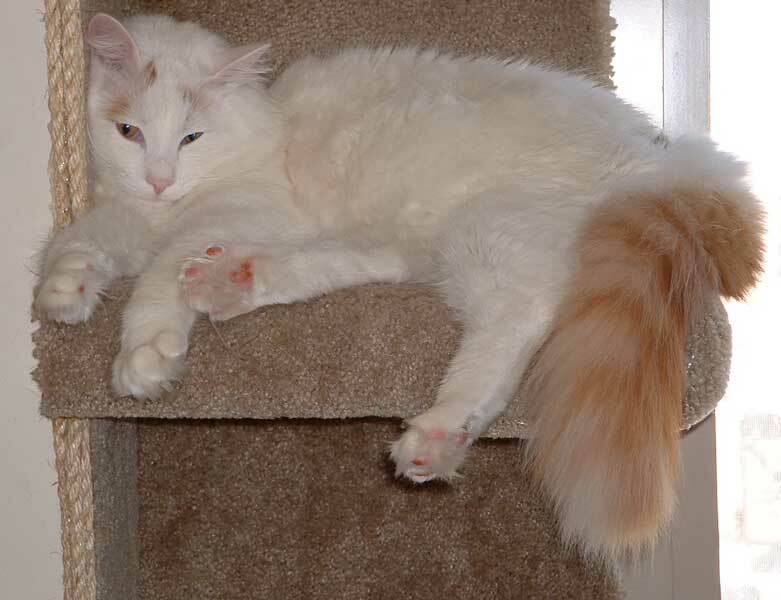 Taji (1994-2004) was a Turkish Van. 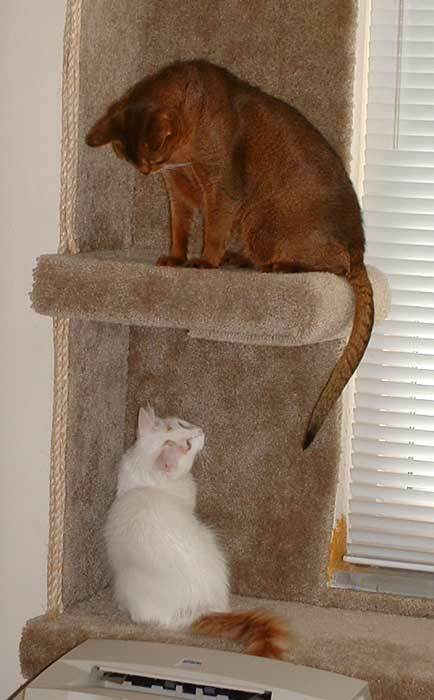 We got him about a year after Faust and Mephistopheles, but they all got along very well. Vans are known as the "swimming cats", because they come from Lake Van (in Turkey) where they do swim. Taji never tried swimming, but he did seem to like water! View his pedigree. 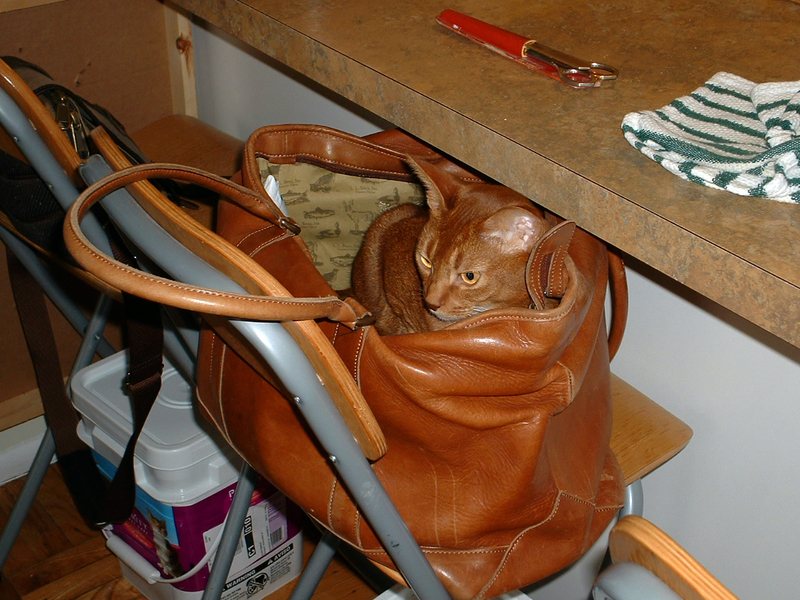 Mephistopheles (1994-2006) (we called him Pheles, as in 'fleas') was an Abyssinian. We chose his name because he was red like the 'devil'. It's funny that the breeder had named him "Nicky", which is another name for the devil! 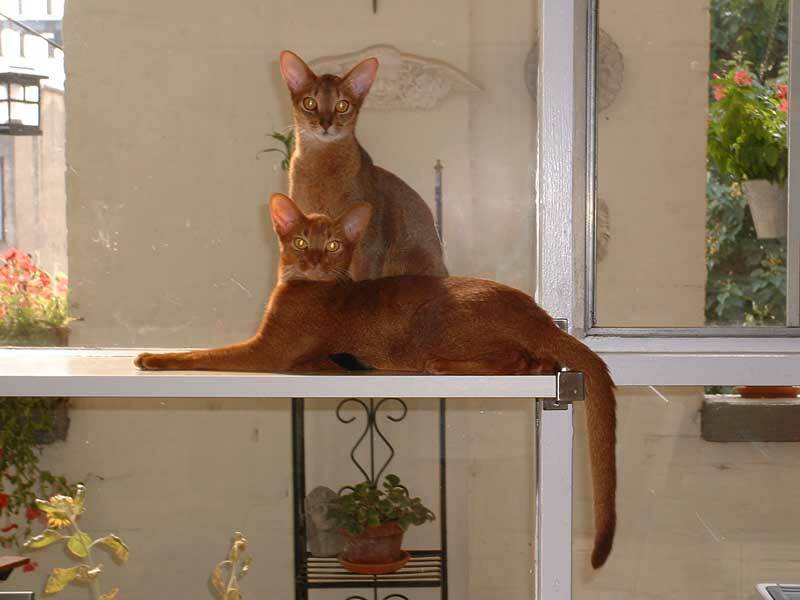 (Abyssinian kittens are devlish!) 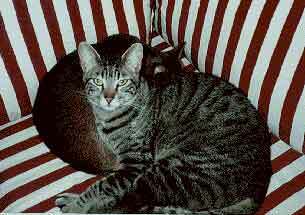 We brought him home on the same day as Faust, in February 1995, and they were just like brothers ever after that. He loved to pretend he was the Jaguar emblem! 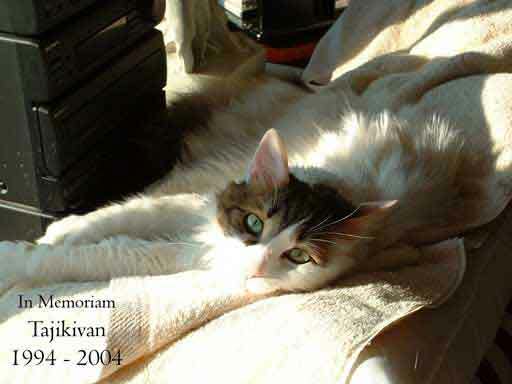 View his obituary and his pedigree. 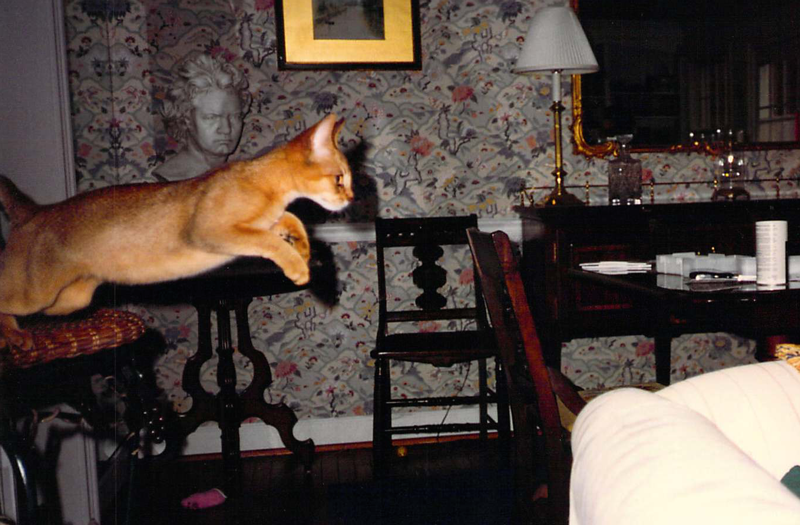 Faust (1994-2012) was an Egyptian Mau. His grandmother was actually a wild Mau living around the Pyramids in Egypt, who was imported to increase the gene pool of Maus. He loved prosciutto (don't ask me - I don't understand it either). View his obituary. 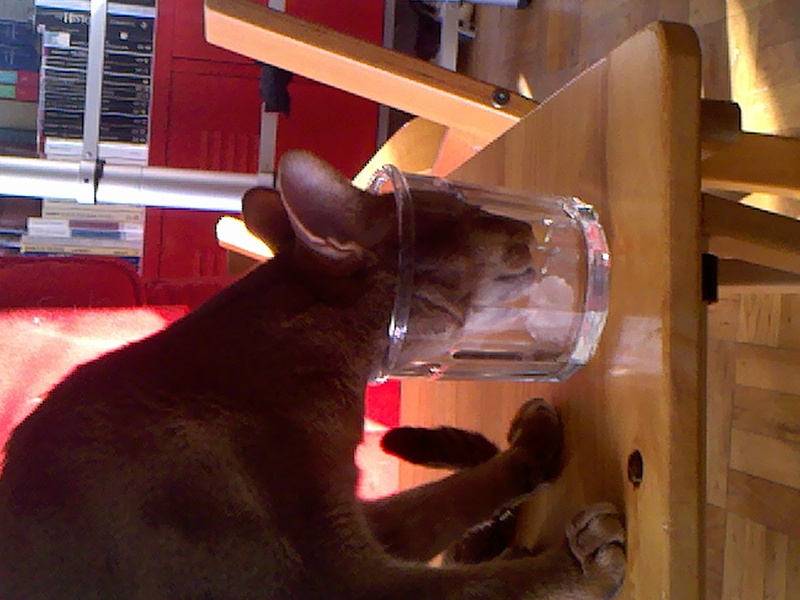 Phobos (2005-2015) was born about 2 weeks before Deimos, and both came to live with us on February 18, 2006. They came from Abykatznn, which is the same cattery where we got Lucifur. 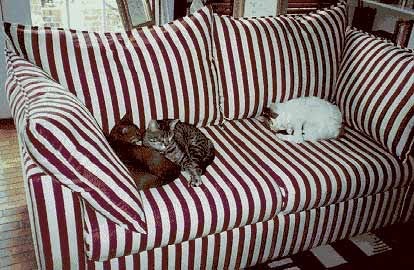 There was no "introduction period" necessary with them - they immediately got along like they'd always lived with us. He was extremely agile and friendly all of his life. View his obituary. More photos of our cats are here and an iMovie is below. 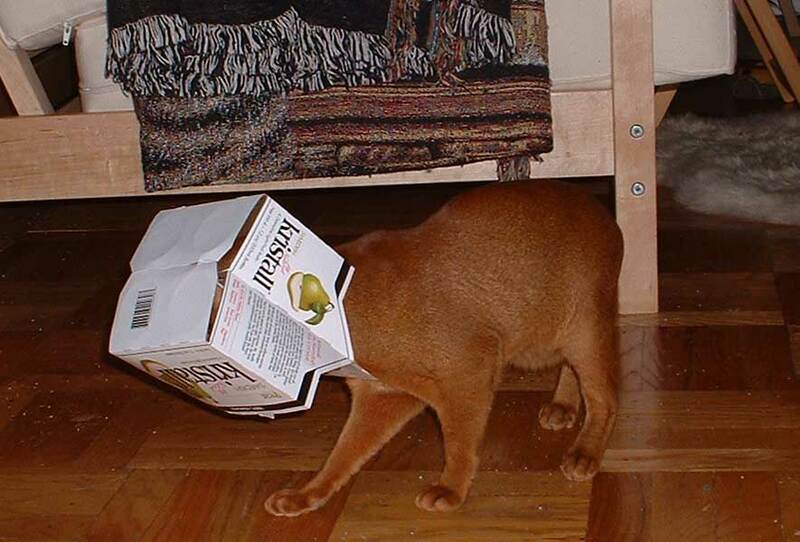 Cat Food Nutrition Calculator - which I developed to select foods for our cats - is here.